Usage/ Application: Pillow packs are great for small, light products offering high retail visibility due to their unique shape. Special features: Attention grabbing transparent carton. Usage / Application: Used to secure product in thermoform or vacuum form insert where a clear view to the product is essential to branding and visibility to the consumer. Special Features: The thermoform insert holds the product(s) in place inside the transparent sleeve. Usage / Application: Blister packs are used in combination with a paperboard backer card to secure your product within the transparent packaging. Special Features: The blister packs are formed to the unique shape of your product. The package design incorporates your branding and product information on the printed paperboard backer attached to the blister pack. Usage / Application: The long narrow and cylindrical design of the clear tubes allows creative packaging solutions for bottles, games, toys, apparel, health, beauty, games, and anything circular in nature that can be stacked. 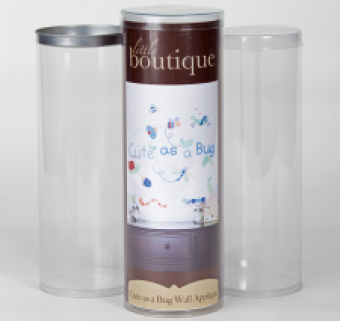 Special Features: This transparent tube can accommodate a printed paper insert for branding. Lids are available in clear plastic or metal (gold or silver in colour). Create a unique display using clear packaging tubes. Usage / Application: Clamshells are used to hold and secure many products while allowing a clear view of the product. Special Features: The thermoform clamshell package is custom designed to your product. Our expert packaging design team will help you create the perfect style for your retail product - packages designed to sell your product.